Ricky Burns tenuous links to world level boxing seems to have finally slipped away after losing a 12 round decision in his home town to previously unheralded Montenegrin Dejan Zlaticanin. The tale of the fight was pretty much summed up in the first 15 seconds of the bout as Zlaticanin landed a swift left hook that floored Burns. To his credit Burns made a bout of it but always looked second best. Zlaticanin walked away with the split decision victory and will fancy stepping up now he has bested what might be the fading start of Scottish boxing in Ricky Burns. In the undercard two cracking fights saw wins for two other Scottish fighters. First up Stephen Simmons beat English opponent Wadi Camacho in a back and forth battle. Camacho looked fairly solid and easily in front as Simmons concentrated solely on winding up big punching that found moderate success but as the fight got towards the later rounds both fighters looked tired and Simmons found a second win. In the final round Simmons found the breakthrough with a huge left and Camacho had no answer before the ref stepped in to stop the fight. The fight of the night came in the Willie Limond and Curtis Woodhouse battle for the Commonwealth and British light welterweight title. Limond and Woodhouse both showed excellent skills with Limond just being that bit sharper, particularly when dropping Woodhouse twice with uppercuts early and late in the fight. It was a mixed fight for Scottish fighters but yet again Matchroom promoter Eddie Hearn put on a great card of competitive fights and the fans were the winners as much as Simmons, Limond and the now very interesting Zlaticanin. 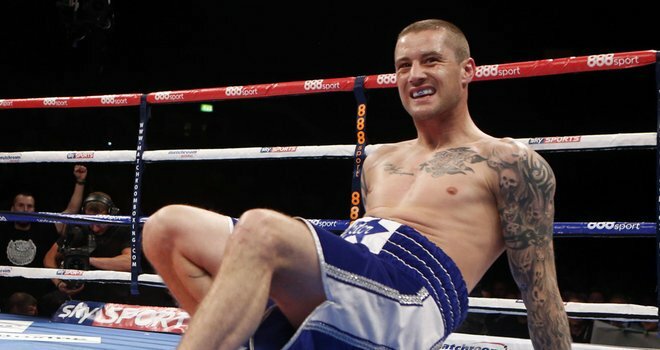 Bit of a set back for Ricky Burns, second successive defeat now for him. You have to ask was his opponent to much of a danger to face in a comeback fight? Burns last the 3 fights record shows as 0-2-1, not that great at the moment. However, Simmons mowed down Camacho who got tired and sloppy towards the end of the fight, it’s a shame that Woodhouse couldn’t go any further than that level as Limond stopped him is his tracks. I think that is Woodhouse’s limit and can’t fight above British level. Great fights though, on to Crawford vs Gamboa tonight!